Handcard. Please forward to friends, and make copies and distribute. Endorsement – Key Hawaii Conservative: Edward Gutteling, M.D. Whew. A candidate’s first responsibility is to win election, in this case re-election. We did. Thank you for your support. That’s where I’ve been, hoping our website blog could stand on it’s own til I got back. Appreciate your patience. I’ve been busy winning election in a very competitive year. Also, have to update you on SHOT, GAOS, CPAC and much more. Only, holy cow, like to do that before we get to NRAAM in a couple weeks. We won. There is no way we do this without a great team, and all of you Sharing, reporting, retweeting, posting, talking, advocating for me on podcasts and radio shows. Thank you. Couldn’t win without you, and believe I am so far pretty good at what we need for the Second Amendment. NRA and our 2A community has a lot of challenging work laid out, and I’m in the middle of it. As I just wrote a friend, it is all the work that I can’t report that is important. Yet, I’ll see you at Friends Dinners, events including Indianapolis NRAAM, and some new (to me) events this year. Please stop me for introductions. Let’s meet and grow our community. 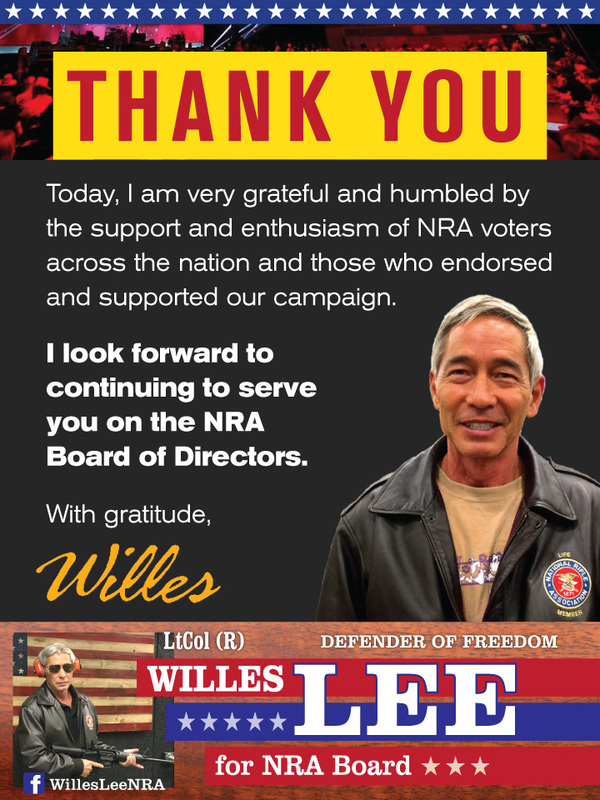 Copyright © 2019 Willes K. Lee – NRA Board of Directors. Powered by WordPress. Theme: Accelerate by ThemeGrill.